Breast cancer survival rates have been gradually improving for the past decades and more women are surviving breast cancer than ever before: 8 out of 10 women will now survive the disease for more than five years. For stage I breast cancers the survival rate is even higher: 9 out of 10. The downside is that the incidence rate of the disease has also gone up, and the risk of developing breast cancer is now as high as 1 in 8. Sounds depressing, and the question of course is: why? In their latest blog post, Cancer Research UK discuss some of the possible explanations. I just read on Orac’s Respectful Insolence that Kim Tinkham has died of breast cancer. A few years ago Kim Tinkham was diagnosed with breast cancer. Inspired by Australian Rhonda Byrne’s book The Secret, she decided to treat her cancer with alternative therapy only. 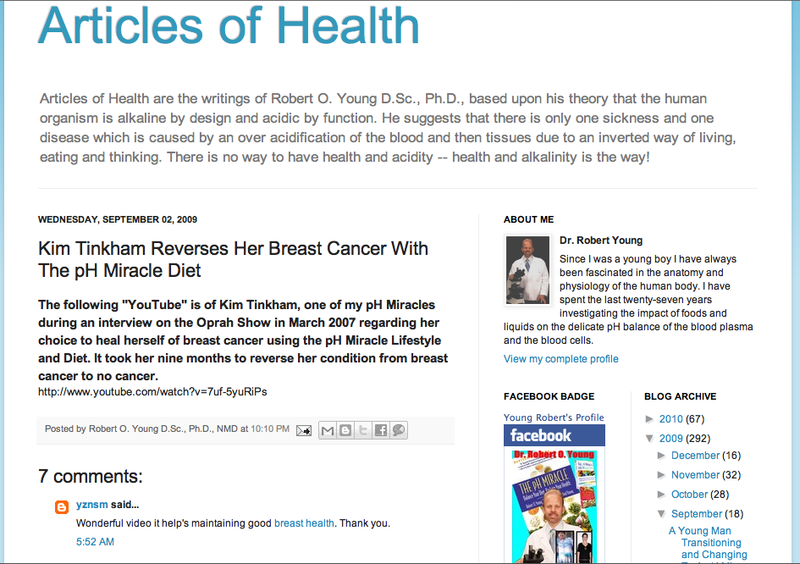 An important part of Kim Tinkham’s treatment seems to have been Robert O. Young’s acid based therapy, which claims that cancer is always caused by excess acid in the body and consequently the only way to cure it is by adhering to an “alkaline” diet. On several occasions, Tim Kinkham publicly claimed she was cured of her breast cancer thanks to alternative therapy. She appeared in several of Robert Young’s promotional videos (most of which have now been removed) and was touted by him as one of his success stories. Kim Tinkham also appeared on the Oprah Show, where she explained how The Secret’s “law of attraction”, which claims that we attract what we think and feel, had inspired her and led to her cure. The See This! page has just been updated. New videos have been added to the section on apoptosis. There also is a new section, titled Signs of cancer.